Team Pogue is your local resource for 55 plus communities and active adult living in the greater Charlotte area. All of the members of our team live, work and play in one of the premier active adult lifestyle communities in the area and we understand your concerns about 55 plus market because we feel the same way! Whether you are looking for the perfect community to retire or to meet 55 plus neighbors still working toward their retirement goals, there are dozens of active adult communities to choose from in the Charlotte area. We have set up an informational website that provides detailed information on all of the communities featured below. If you have a question about ANY active adult or 55+ community nearby, please contact us. We can help you find the right neighborhood and home! Contact Team Pogue today for a free homebuyers consultation! Whether it’s a table tennis tournament, annual craft show, woodworking club or monthly lunch bunch and bridge, you’ll find there is something in Sun City for every active adult buyer. Developed by Del Webb / Pulte Homes, Sun City Carolina Lakes is exclusively for 55+ active adults. The single family, villa and carriage homes range in price from $225,000 to over $550,000. Sun City features multiple home collections and models within each collection. From large manor homes to smaller townhomes and carriage homes, there are options for every buyer. 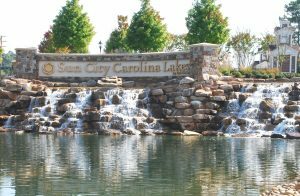 For more information about Sun City Carolina Lakes, visit our community page. Tree Tops is a gated community exclusively for the active adult life. Nestled amid an old growth forest, the neighborhood will feature resort-style amenities like pickleball, hiking trails and more. Tree Tops is located on 9070 Van Wyck Road, Fort Mill, S.C. 29707 . Lennar, one of the Charlotte area’s most reputable homebuilders, is pleased to release new renderings and a site plan for Tree Tops, an active adult community approved for nearly 800 homesites in Lancaster County, S.C. Reflecting the community’s “return to nature” lifestyle, the renderings include the main entrance, amenities center and one-of-a-kind village center with 10 log cabins devoted to various crafts and hobbies. Tree Tops’ resort-style amenities will feature a pool, clubhouse with state-of-the-art kitchen and fitness center, pickleball, walking trails and a waterfront amphitheater for events and gatherings. In addition, a village center with 10 log cabins will include a celebration center, business center, card room, news room, sewing room, nature room and more. For more information about Tree Tops, visit our community page. Construction has recently started in this community and the sales center is open. Allow one of our agents to take you to see Tree Tops and help you decide if the community and one of their new home designs works for you! Lots and new homes are available in this community. Please contact Team Pogue for more information on construction and homes available in these communities. Developed by Del Webb (which recently completed development of Sun City Carolina Lakes), Carolina Orchards is located in Fort Mill, SC in York County. Ideally located near Fort Mill, SC and just a short drive from uptown Charlotte, Carolina Orchards offers the convenience of active adult lifestyle with lower taxes offered in York County than nearby Mecklenburg County and the advantages a larger city has to offer close by. 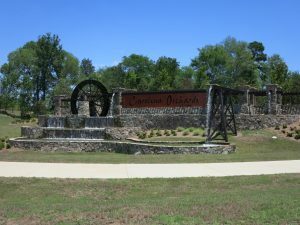 Carolina Orchards is also located near award winning golf courses, two recreational lakes, and the Anne Springs Close Greenway. Carolina Orchards will offer 11 home designs in three collections, the Passport, Expedition and Pinnacle Series, ranging from 1234 to 2565 square feet. Planned amenities feature a clubhouse, pool, sports courts for pickleball and tennis, outdoor pavilion, garden plots, and dog park. For more information about Carolina Orchards, visit our community page. Construction has recently started in this community and the sales center is open. Allow one of our agents to take you to see Carolina Orchards and help you decide if the community and one of their new home designs works for you! Please contact Team Pogue for more information on construction and available homes in Carolina Orchards. The Meadows at Carlina Reserve’s homeowners enjoy access to a recently built clubhouse. This 6,000 square-foot amenity center is open to all residents of the master-planned community Carolina Reserve and includes a multi-purpose room ideal for playing cards or hosting parties, a meeting room with a conference table, a catering kitchen, as well as an exercise room. The outdoor amenities include a pool, splash area, playground, outdoor patio and miles of walking and biking trails. Contact Team Pogue for more information about new homes and villas in this community. Contact Team Pogue for more information about homes in this community. Homes for sale in Regency at Palisades. Four Seasons at Gold Hill offers its active adult residents the convenience of living in low-maintenance homes. The community has 301 homes developed by K. Hovnanian. Homebuyers can choose one of the 112 townhomes ranging from 1392 to 1969 square feet or select one of the 189 single family homes in the community. There are 14 two to three bedroom single family home floor plans offered that range from 1480 to 3420 square feet. The neighborhood amenities include a 12,000 square foot clubhouse and numerous activities including clubs, neighborhood socials and day trips in the area. Contact Team Pogue for more information about this community. Augusta Place at Laurel Creek is a 52 home active lifestyle community within the master-planned Laurel Creek neighborhood. Originally developed by the Warren Norman Company, the community has several homes built by a variety of custom home builders under Warren Norman, however the bulk of the community has been developed by Epcon Communities since 2012. The community offers two to four bedroom luxury patio homes ranging from 1500 to 3200 square feet. Phase 1, which had no age-restriction, has recently sold out and sales are beginning in Phase 2 which will have age-qualification requirements. In both Phase 1 and Phase 2, active adults and retirees will enjoy the maintenance-free lifestyle and community amenities. Homeowners will find luxurious high-quality patio homes combined with resort-like features within an upscale community. The Laurel Creek community offers a Swim and Racquet Center which is open to all residents of Laurel Creek. The center includes an Olympic size 25-meter lap pool, a childrens play pool with a water slide, a kids wading pool as well as hard-surface and clay tennis courts. Additionally, there is a multi-purpose facility open to all residents to use for special events or parties featuring a 4,450 square foot ballroom. The Village at India Hook is an active adult community that offers the amenities, home types, and low-maintenance lifestyle that attracts 55+ homebuyers from all over the country. After seven years of development by Epcon Communities, The Village at India Hook was completed in 2014. The 58 attached villas offer open floor plans and beautiful finishes. These low-maintenance homes allow residents to take full advantage of the amenities and activities in the community. The 3,000 square foot clubhouse includes an exercise room and multi-purpose rooms where residents enjoy card games, arts and crafts, and club meetings. Amenities also include a pool and walking and biking paths throughout the community. Contact Team Pogue for more information about new homes in this community. Developed by D.R. Horton and Tribute Homes, Lake Ridge was developed beginning in 2009. New and resale homes are available ranging from two to five bedrooms. Grayrock Village is one of eight villages situated throughout Lake Ridge. Grayrock Village is an active adult lifestyle neighborhood that allows residents to take advantage of all of the amenities offered in the Fort Mill and Lake Wylie area. The age-appropriate community of Lake Ridge distinguishes itself with resort amenities, such as a swimming pool, tennis courts and paved walkways. The master-planned community of Lake Ridge has a 7,000 square foot clubhouse that includes a state-of-the-art fitness center as well as a gathering area with a fireplace, a catering kitchen, and hobby and game rooms for club and resident gatherings. Kolter Homes recently announced that they plan to build a 55 plus Cresswind community in the Charlotte area. Kolter homes has started construction, however, the sales center has not opened yet. Check with our team to learn more as updates are available. The eight year build out would result in an 800 home community. Homes are expected to range in size from 1500 to 3000 square feet with prices starting in the low $300,000s. Amenities would include parks, open spaces, trails, a clubhouse with kitchen, tennis and pickleball courts, a swimming pool, and outdoor entertainment spaces. Kolter announced that they hope to work with the adjoining Larkhaven golf course to provide golf cart access to the course from the community. Neighborhood shopping and a possible continuing care residential facility would be built on a portion of the site. This community is in development. Contact Team Pogue for more information. Encore at Eden Hall, developed by David Weekley Homes, is a new development that will feature one and two story attached townhomes featuring downstairs owners suites and low maintenance living with lawn care included in homeowners fees. Homes are built with energy efficiency in mind and are backed by the Environments For Living® Program’s heating and cooling energy usage guarantee. Five floorplans are offered with two and three bedroom models ranging from 1700 to 2800 square feet. Prices start in the $400,000s. Located in Matthews, NC the community is ideally situated for residents to enjoy its charming downtown area and the Matthews trail system. Encore amenities will include walking trails, a scenic lake view from overlooking gazebos and linear gardens.